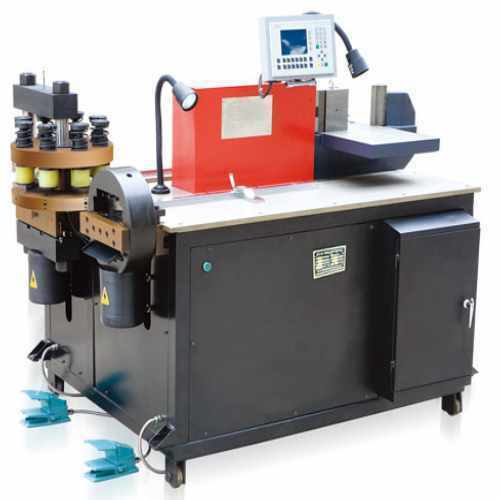 We have a unique range of bus bar punching/bending machines (Model: MB303-T ). The punching or bending machines helps in increasing the production efficiency and ensures the long life of shearing unit with reliability. Other than this, they offer precise bus bar bending angles. These machines are offered to our clients at highly competitive prices. With our extensive knowledge, we have become one of the eminent suppliers, importers and exporters of technically advance extrusion production line (copper/aluminium), upcasting machinery, insulation components processing machine and winding machine. These are widely used in varied industrial units like extrusion, civil and construction industry. We source these products from the reliable and trusted vendors of China and supply them to our clients based in India, USA, Kazakhstan, Brazil, Turkey and China. In India, we have got rich experience in marketing and supplying a range of construction machinery equipment. In a very short span of time, we have also got trade affiliation from Ministry of Commerce and Industry. We are professionally managed by a team of experienced professionals who posses in-depth expertise in supplying and marketing of Industrial Machines. Our quality is trusted by many leading names of the corporate world including Vijai Electrical Ltd, Hyderabad, Morakiya Metals & Alloys (P) Ltd, Gujarat, Leebo Metals Pvt. Ltd. To carry forward our business operations smoothly, we have set up three overseas sales & service offices in India, Turkey and Brazil.